We have three restaurants and two bars offering a wide variety of dining and drinking experiences, ranging from fine dining to poolside snacks. 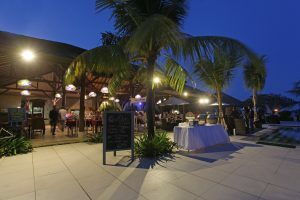 Our restaurants serve a large selection of Western and Asian dishes and our bars provide a perfect location to enjoy a delicious tropical fruit cocktail or a cold beer. Located by the pool side with a seafront view and a relaxed atmosphere, The Golden Beach serves both local and international cuisine. This is the location of our buffet breakfast, with the restaurant remaining open throughout the day to serve lunch and dinner. 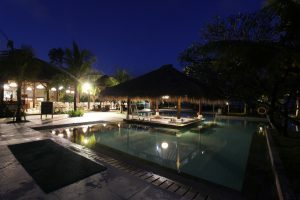 Special evening activities (such as Balinese dancing) and themed dinners are held at this venue throughout the week. Keep up with your favorite team or player on the large screen or have a game of pool while enjoying a cold beer. 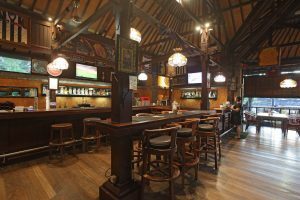 The Sports Bar is also a great place for an informal dinner with friends and family. A variety of events are held here throughout the week, including live music, quiz and karaoke. 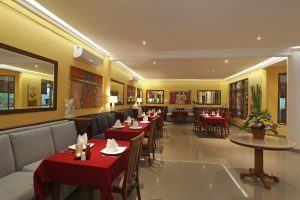 An air conditioned restaurant, which provides a romantic setting for a fine dining experience. 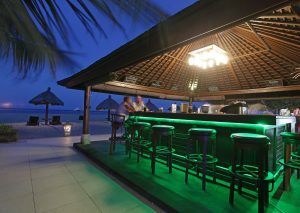 The Jacaranda opens every evening and serves a delicious menu that is fusion of east and west. The restaurant can also be hired out and is the perfect venue for small private parties. Enjoy the quintessential island experience of a tropical cocktail, a cooling sea-breeze and a beautiful beach view in the laid back atmosphere of The Reef Bar. Take your holiday relaxation to the limit by making use of The Sunken Bar’s underwater seating and enjoy a tropical cocktail or tasty bar snack without even getting out of the pool!